Need a floor vent cover that is well designed for either hardwood or carpeted flooring? 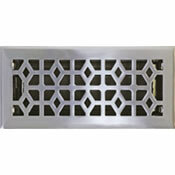 Well these Marquis satin nickel floor registers are plated to add a beautiful color to your home. 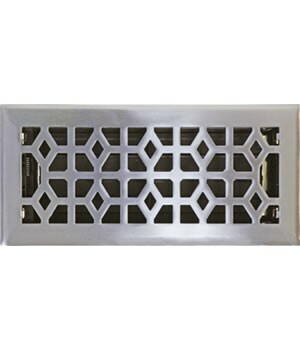 The floor vent cover features a steel damper that is adjustable to control your airflow. Moreover, the satin nickel floor register is made out of a steel faceplate and provides your floor vent cover with added strength. This floor vent cover can actually hold up to 200 lbs of weight! The installation for this floor vent cover is simple, take the satin nickel floor register and drop it into the floor opening and viola! You could have this beautiful satin nickel floor register sent straight to your door for one low price with standard shipping. Tip: To order the correct satin nickel floor register, measure your floor hole opening. 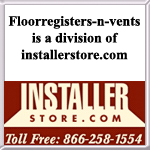 A 6" x 10" floor vent cover will fit into an opening measuring 6" x 10". Please note:Please allow 2-7 business days to ship from the manufacturer. We have a large variety of floor vent covers available for purchase that come in other finishes and an abundance of finishes. Liven up your floor with satin nickel floor registers designed to add some elegance to your decor. Try them today to see the change!